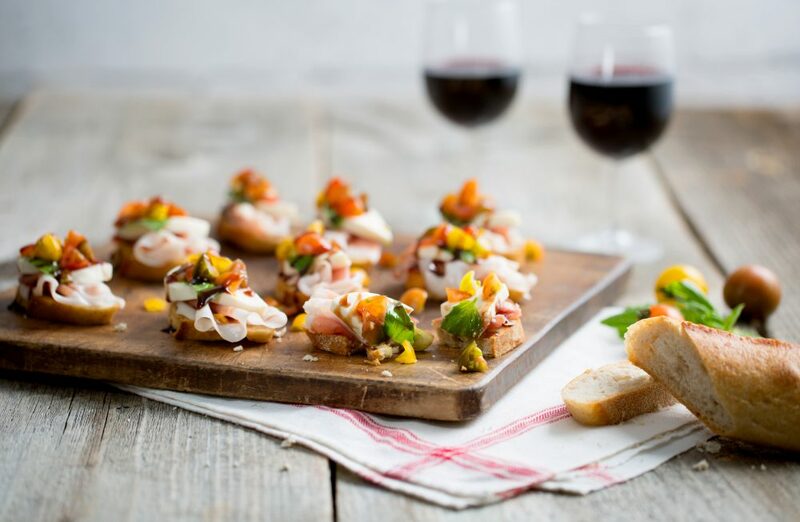 There’s something so delightful about the simplicity of the perfect bruschetta, and a Prosciutto Bruschetta is just what your tastebuds have been waiting for. Seasonal tomatoes are a perfect addition in the warmer months and combined with the savory yet slightly sweet Prosciutto di Parma, makes the dish complete. Guests for every sort of get-together will be fawning over this prosciutto bruschetta, so it’s best practice to save yourself just a few extra on the side. Serve with a glass of rosé or sauvignon-blanc to make them even more decadent. Take a look at some of our charcuterie board ideas for the best platter pairing suggestions. Brush both sides of baguette slices with olive oil and rub with cut sides of garlic. On a baking sheet, arrange baguette slices in a single layer and cook until lightly toasted, about 5 minutes. Top each baguette slice with prosciutto, mozzarella, basil and chopped tomatoes, dividing evenly between toasts.